The actual making of fabric...the creation of cloth, and the imprinting of specific designs, and how and why they were chosen..is something that I have been very interested in. When I was a young girl, I can remember literally creating my own fabric pattern designs, as well as fabric designs. But all I did was draw on paper, and color on cloth! I can still remember my father explaining to me about cotton gins, and textile mills and the history of the sewing machine. I can remember feeling amazed, just as we all are when we actually think about how things are truly made. And so years ago, when I actually had the opportunity to listen to a lecture and to meet a very famous traditional quilter/ fabric designer/ author of dozens and dozens of books, I was delighted that she actually explained....with a great deal of surprising honesty... how her own 'designer' fabrics come about. She honestly told us she didn't really design them at all. What? I practically said out loud! She said that almost all of the time, she simply bought a piece of vintage fabric, or a sample book of vintage fabrics, (from flea markets especially in Europe) and then showed them to her company and their artists did all of the drawing or scanning or whatever was required to re-create the design into fabric. I remember being absolutely amazed at that! I thought all designers were artists and they created the ideas, the prints, the flowers, whatever...themselves! Not how it works. The person who gets their name on the selvage has input, but as other local designers have told me, "some times they use the colors we pick and sometimes they don't." They decide if you get more patterns in the collection, but they usually pick out the extras...like a fabric in a stripe and a dot, one or two fabrics in tone-on-tones to help hold together the collection and an accent fabric to bring out secondary color and help to balance the colors of the overall collection. I knew then, we all have it in us to create art, as well as fabric. And now, of course, there is Spoonflower, and other companies that will do just that for you! Transfer your drawings or fabric swatches into yards of fabric and printing it off for you at varying costs.So, how wonderful that is for those who can, and want to! We can all be designers and we can all express our love of the craft..we just have to be able to afford that process! his friend's daughter worked for Robert Kaufman and that was all it took.That, and it being the right time for this look to be wildly popular again, the right connection with a friend and maintaining that connection, a good memory from the friend's daughter...and Lorene Carnes, age 92 early passion for art and design as well as her ability to hang on to a part of her life that once had been very special to her! Turn out, of course, that vintage and retro and graphic design drawing of fashion sketched ladies is super 'in' right now. And fabric companies design fabric based on consumer demand and interest. A sketch can become fabric in as little as four months, and Lorene Carnes, age 92, checked her mail recently to discover, yards and yards of her own sketches on fabric. There are changes the fabric artist made, of course..they didn't use Lorene's exact sketches because its all about consumer driven sales..but they are very close, if not the same! and of course, you can see the entire collection at Robert Kaufman..these are her drawings turned into fabrics..you add your own dots and stripes and blenders...but it would be so easy to do! I can see these turning into cute totes, makeup or hair accessory bags, or even cute aprons especially using vintage patterns. Yep.....lots of possibilities! And I can even think of a few more that I'll keep under my vintage hat and think about making myself! 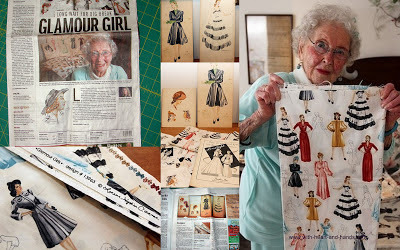 Thanks for sharing the Lorene Carnes story - I'm looking forward to seeing all of her fabrics. What a great story. That fabric design is delightful. Yes, I can see a cute apron, or even cafe' curtains for a teen who likes retro fashion. Thank you so much for giving us this story. I am going to find some of that fabric. What fun. What a fantastic story! So wonderful how this came to fruition after so many years. Can hardly wait to see the fabric and what I can make with it. Kudos to Lorene for saving her artwork. Dear sweet Nancy-Rose, the fabulous Maritza, beautiful Maria Rose, amazing Barbara,the 'Dread Pirate'Shelley, the ever talented Christine Thresh, the creative and super achiever, Debra Spinack, and the truly lovely Celia Ambrose....and anyone else who comments after I type this!!! I am delighted to hear from you and so happy to know you enjoyed my post! It gives me the chance to thank previous readers, introduces me to new readers, and gives me a chance to check out their own blogs and websites. So, thanks so much! What a joyful story! Lorene's illustrations are so lovely and evocotive of earlier times. I would love to see that fabric used as a backing! But I ask, did we really have waists that were that small? Sigh! as always my friend you have shared a unique and inspiring AND quilt related (ok, fabric counts) story that is just so wonderful!!! thanks as always for sharing this delightful story and I hope Lorene is as tickled as can be! What a wonderful story! Thanks for sharing this. Interesting about the fabric designing too. I love to choose fabric but the designing of it is over my head. So happy for darling Lorene! What a sweet story! I didn't know that is how they made fabric, it seems like there would be copyright issues somehow, but so wonderful that original designs are also used.